Full disclosure: I am a Boston fan. As many of you may have heard, the Patriots won the Super Bowl last week, their 4th since 2001, and cemented their place as one of the best football teams ever. While some rankings have them just barely trailing the ’80s and ’90s 49ers as the greatest NFL dynasty of all time, there is no arguing that the Patriots have been the best of the NFL during the 21st century. But have they been the best sports team of the “big four” sports leagues during that time? Comparing success across leagues is hard, but we can attempt to do it in a quasi-scientific way by using the same system we used to rank the top coach/QB combos of all time. Although all point systems will in some way be arbitrary, this system passes the “smell test” not only in our article but also in the ranking of the NFL franchises from where we actually took the point system. 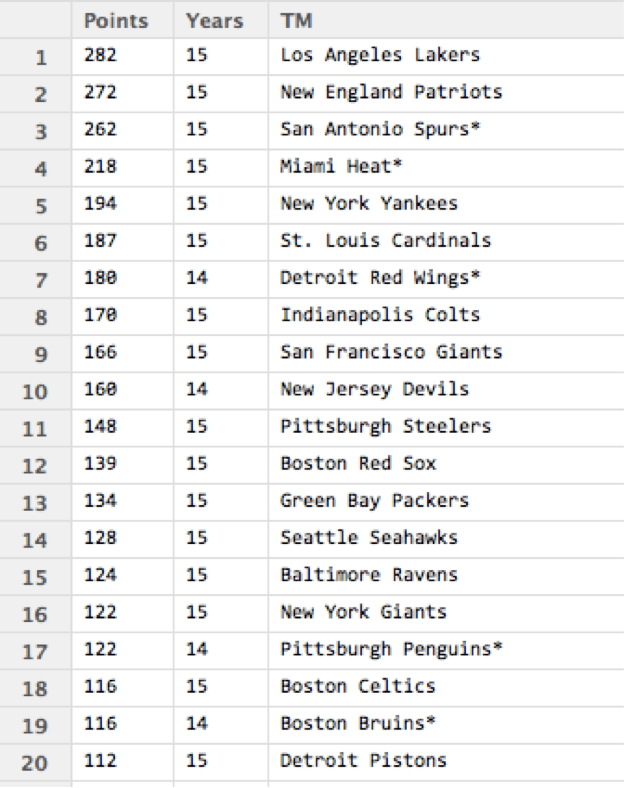 We used that point system to rank every NFL and MLB team’s success beginning with the 2000 seasons, and every NBA and NHL team’s success beginning with the 1999-2000 seasons. That gives us 15 years for each sport, except for the NHL in which there was no 2004 season due to the lockout. The top 20 twenty teams of the 21st century by this ranking system are displayed below. Again, this passes the smell test. The Patriots come in a solid second, trailing only the Lakers and their five championships. The Heat and Spurs, the other top NBA teams, join the MLB-leading Yankees in the top five. The Detroit Red Wings, the highest NHL team, come in seventh. While this may seem a little low, it is important to remember that the NHL had one less season than every other sport and the Red Wings have only two titles in this timeframe. Furthermore, all of Boston’s four sports teams come in the top twenty – Patriots in 2nd, Red Sox in 12th, Celtics in 18th, and Bruins in 19th. 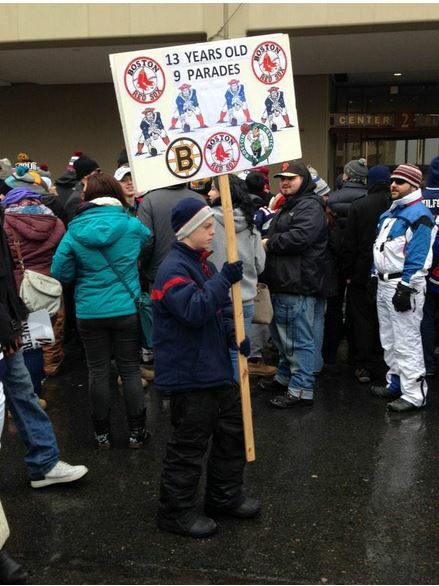 This brings us to the biggest question of them all: is Boston the best sports city of the 21st century? The answer is clearly yes, no matter how you look at it. To go about determining this, we first had to decide which teams belonged to which city. To do this, we used this Wikipedia page with a few adjustments for the cities that had more than one professional sports team in any league, the theory being that if there were two NBA teams in your city you would only root for one. Luckily, we only had to deal with this for a few cities. Chicago was simple; we just created two fan groups, both with the Bulls, Blackhawks and Bears, and then one with the Cubs and the other with the White Sox. For San Francisco we split up the baseball and football teams (49ers with Giants, and Raiders with Athletics) and then counted the Warriors and the Sharks for both. For LA, we put the two Anaheim teams by themselves, and then had two other Los Angeles teams, one with the Lakers, one with the Clippers, and both with the Dodgers and Kings. Finally, for New York, since they had so many teams we were able to split them into two separate groups. Not counting the New Jersey Devils (who seemed the least New York-y of all the NHL teams), we split the teams up by their accomplishments, putting all the most successful teams in one fan group and the not-so-successful ones in another. We did this to maximize the amount of points one group could get, so no one could claim we stacked the ranking system for Boston to win. The successful teams (Rangers, Nets, Giants and Yankees) became NY1, and the others (Islanders, Knicks, Jets and Mets) are NY2. Compiling the total points for each city listed, we ran into the problem that not all cities had the same number of sports teams. Is it better to have four sports teams that had mediocre success or one really good sports team? There are two simple ways of ranking the cities, one by just total amount of points and the other by average points per team. Combining these two ideas, I came up with a third way – points above average. To calculate this I found how many points on average a team received per year (around 4.5), and then multiplied that by the number of years a professional sports team played in a city since 2000. 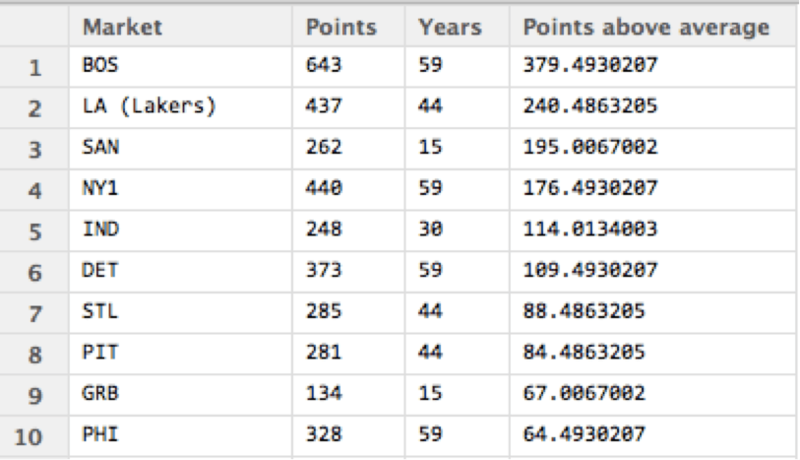 The difference between that number (their expected points) and their actual point number became their “points above average”, which I used to rank the cities, the top ten of which are displayed below. Boston is clearly the best city, not only by total points but also by points above average. Two of the cities in the top ten have only one team – Green Bay and San Antonio – but they have done so well that it doesn’t matter. 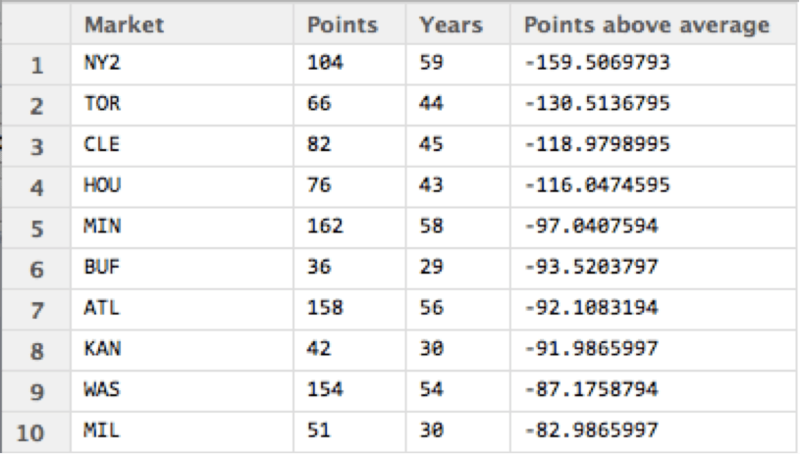 These are also, for the most part, the teams that appear in the top ten in terms of points. The ones that appear in that ranking but aren’t listed above include San Francisco (6th), Miami (7th), and White Sox fans from Chicago (10th). Also, the hypothetical fan group that has had the most success since 2000 is the rare Patriots/Yankees/Lakers/Red Wings fan, aka the most hated fan of all time. While a ranking based on just points features a lot of single team cities, the ranking by points average churns out a bottom ten list comprised of cities with a bunch of underperforming teams. This list is below. What a list. Some of the cities on the list actually have teams that are pretty good at the moment and might go far in the upcoming NBA and NHL postseasons (Toronto Raptors, Cleveland Cavaliers, Houston Rockets, Atlanta Hawks, Washington Capitals and Wizards), showing that they might be regressing to the mean after their decade-plus of failure. It’s also interesting to note that most of these cities are not exactly known for being fun places to live (good players might not want to live there), the glaring exceptions being Washington and NY2. Of course, NY2 was defined as the worst teams from New York, so it is entirely possible that no one is actually a Jets, Mets, Knicks and Islanders fan. Although, if there is, I don’t envy their sports life. I wonder what would happen if you included Major League Soccer. Boston would probably stay on top given the success of the Revolution. LA would certainly be helped by the Galaxy’s 5 championships.